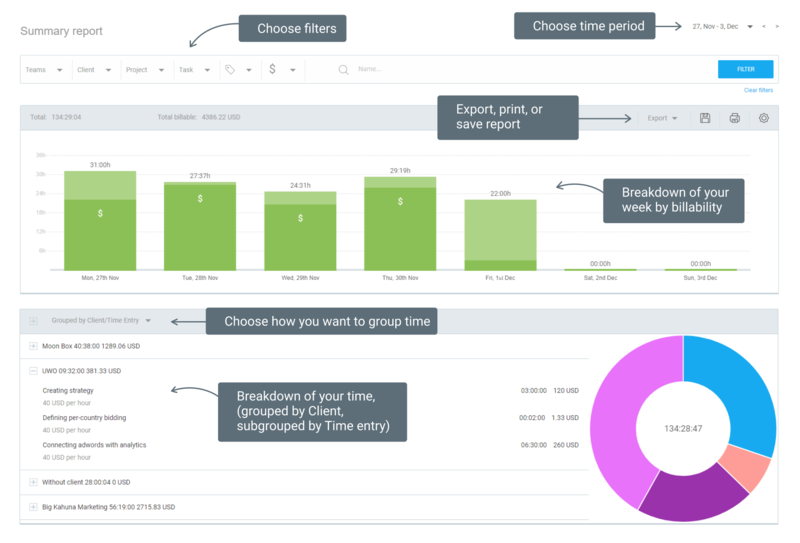 Clockify is the only 100% free time tracking software on the market. 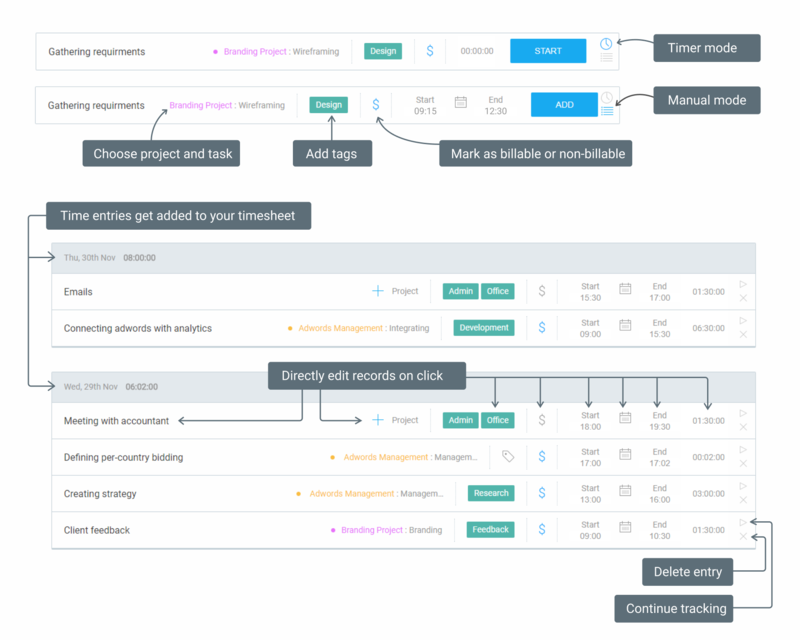 It’s so simple that you and your team can track work time with one click. Everything in Clockify revolves around time entries. You track time you spend working on things and then analyze workweeks in reports. Clockify also lets you invite others so you can track and analyze time together. When you start working, type what you’re working on and start a timer; when you finish, stop the timer and the time entry gets added automatically to your timesheet. If you don’t want to bother with the timer (or you forgot to start it), you can manually add all the time entries at the end of your day. Simply type what you worked on, choose start and end time, and add the time entry. Time entries are more useful once you categorize them. Add a client, project, task, billability status, and custom tags to each time entry so you can better analyze your time (before they’re available for selecting in the Time Tracker, you first have to define clients and tags in your workspace settings and create projects and tasks in Projects). You can add time via time tracker or via timesheet. Timesheet is disabled by default but you can enable it any time you want in workspace settings. Once you have added some time entries, you can visit Dashboard to see how productive you are. 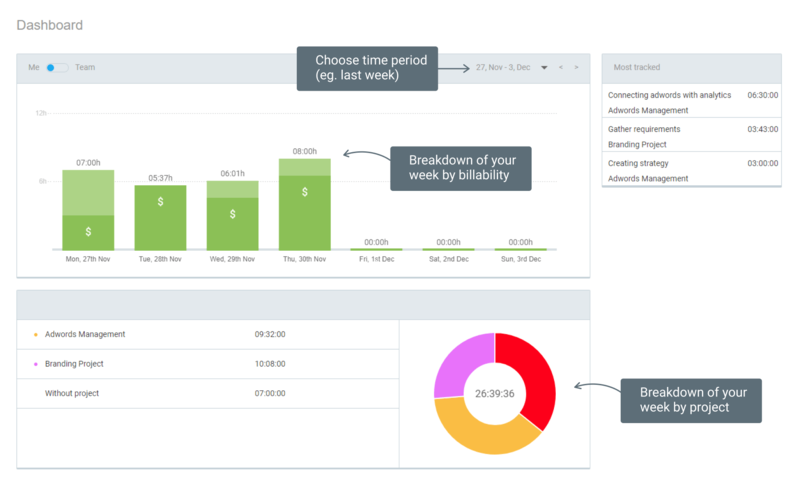 Dashboard shows you at a glance how much time you’ve tracked each day and where you spent most of your time. Summary report is your standard report where you can filter all time entries and get the data you need. Detailed report is for when you want to directly edit time entries you’ve filtered. Weekly report is for seeing who tracked how much time each week. 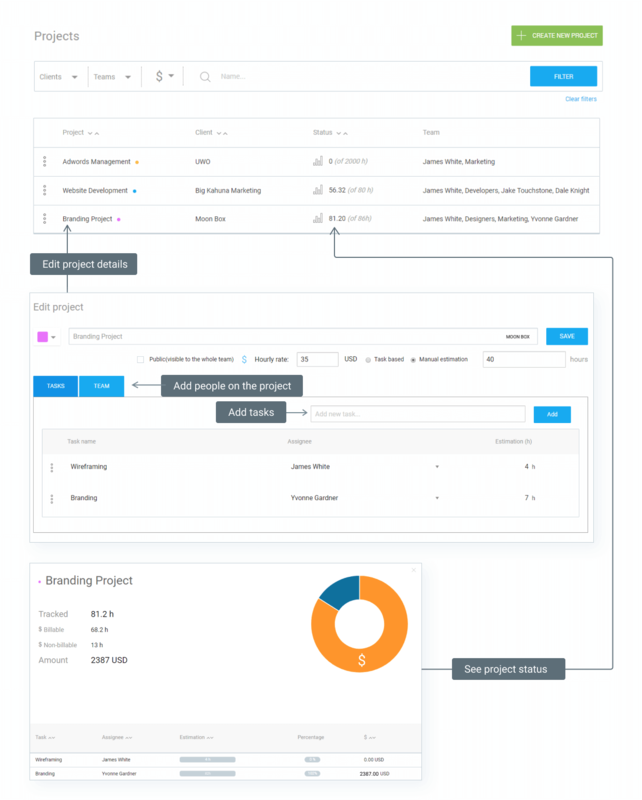 Projects section is where you can set up projects, tasks, and assignees, and estimate and track project progress. Teams section is where you invite team members, define hourly rates for each person, and manage who belongs to what user group. Workspaces are useful when you want to use Clockify for different purposes, and need more “accounts” so things to mix up. 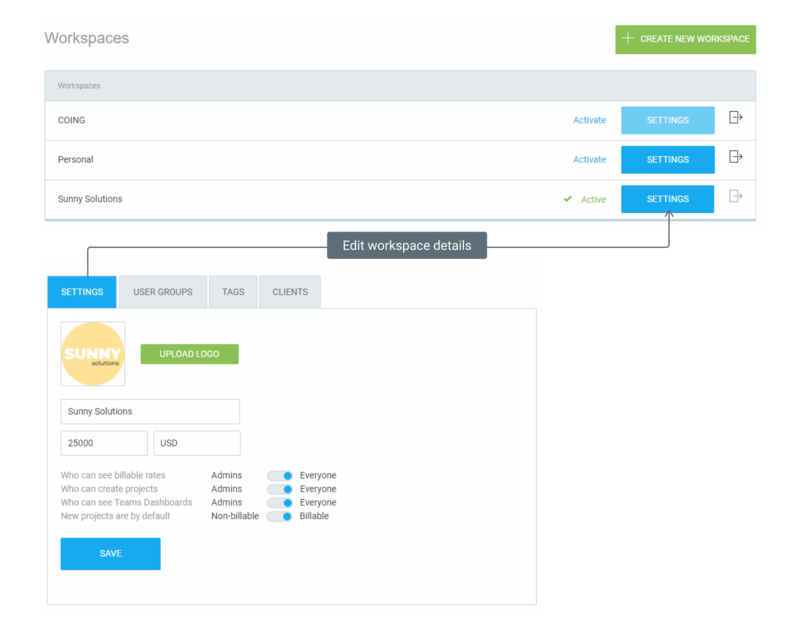 You can set up a separate workspace for each company department. Here, you also create tags, clients, and user groups.